Also known as Hawthorn plants Rhaphiolepis are an evergreen shrub available from wholesale growers in a number of species and many cultivars. Raphiolepis indica is the Indian Hawthorn, while Rhaphiolepis umbellata is the Japanese Hawthorn. Also available are Raphiolepis intermedia, Rhaphiolepis x delacourii. 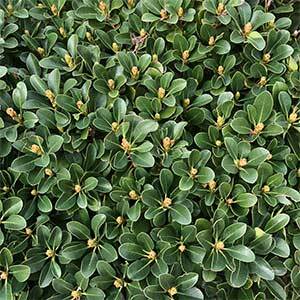 The Indian Hawthorn is an evergreen shrub grown for the foliage as well as the masses os flowers in spring. Frost tolerant and excellent for hedges or as a background plant in the border it is low maintenance and grows well in full sun in a well drained soil. Rhaphiolepis umbellata is smaller growing and a more rounded shrub. Rhaphiolepis x delacouri is a hybrid between the Indian and Japanese species. These are a low maintenance plant that grow well in full sun and will perform satisfactorily in light shade. In shade flowering can be significantly reduced. Being almost totally disease free and fairly insect resistant, these low maintenance plants have a range of landscaping applications. Frost tolerant, low water requirement once established and suited to growing in coastal areas. Rhaphiolepis ‘Snow Maiden’ white flowers from winter through to spring.